I’m not sure what made me deviate from my normal pattern, but instead of waiting until Sunday afternoon to post my two completed projects on Ravelry, for some reason I decided to do it in the morning, then poked around a little bit looking to see what other people had been completing. Then I thought I should find the official finishing time, so I could decide how I was going to spend my Sunday. Was I ever surprised to find that finished projects not posted by midnight Beijing time – noon here – didn’t count! I surely was glad for that little deviation I’d taken! So, my final count is 18 completed qualifying projects – 18 that were laying in a nagging pile of incompletion less than 3 weeks ago, but now each provide a smile of contentment when they cross my mind. 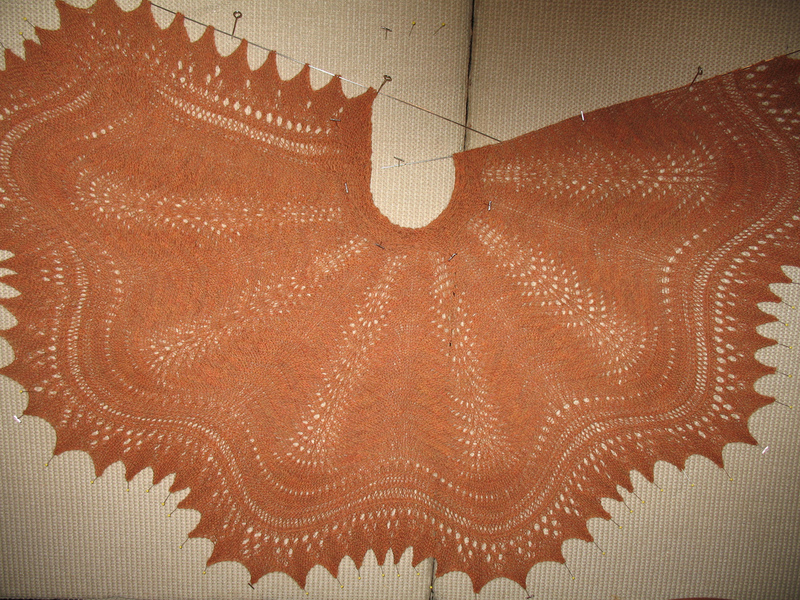 In addition, I spent about 3 hours finishing the knitting on my Little River Wrap and the delicate little Hitty Shawl, so it’s been quite an exciting 17 days here. I finished a lovey blanket, an afghan, felted basket, two shawls, my first pair of socks, and a mountain of clothes enough to spoil a fair number of Bleuettes – and I’m grinning from ear to ear – though I must say that the empty hole in my project box is startling, and the in progress section of my Ravelry page looks quite strange indeed. Here’s an odd bit of perspective on the last two and a half weeks. It was finally time for my celebratory cast on, and I chose to do just one of my promised starts this evening, making a beeline for my Thordic Icelandic Shawl kit. I ended up using size 7 needles, as I’m guessing I’ll be prone to knitting this fairly tightly, I didn’t have size 4 in a long enough cable (lack of sufficient planning), and a lot of people said theirs came out smaller than hoped. I cast on all 339 stitches provisionally without a hitch and knit the first 8 rows. Despite some comments on Ravelry about this being a boring knit, I’m actually looking forward to something a bit mindless but not totally dull, and I have my Suri Shetland Throw to work if I need a bit of spice. So, it’s over… and it seems quite strange actually. I can’t believe 17 days could go so quickly, nor that I could accomplish so much in that time – and I’ll miss it, I’m sure. But now it’s time to get back to my version of real life, and there are 4 remodeling projects, a good bit of clutter, and a painfully large mountain of email all awaiting my hand. 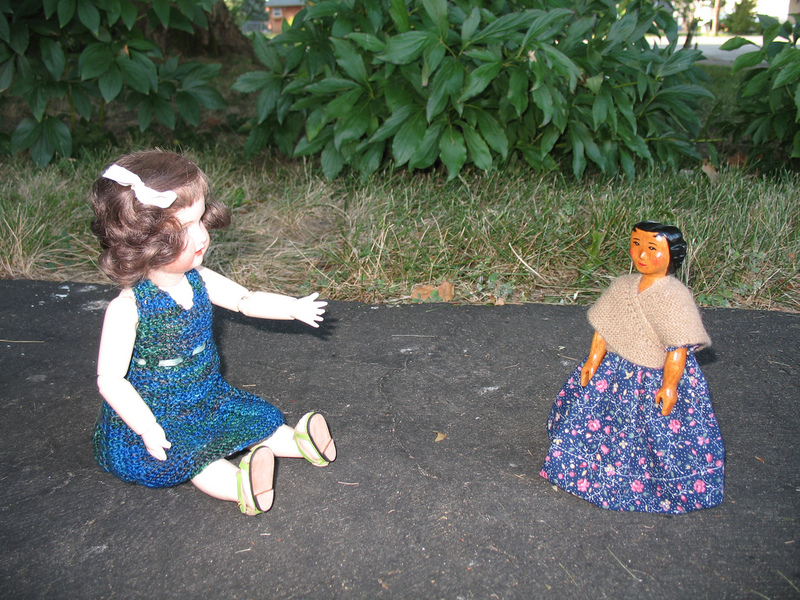 First up is Martine sharing her final Ravelympics outfit and my fourth dress from Inma’s Succès pattern. Of course, this is an interpretation of a Gautier-Languereau oufit sold for Bleuette in the 1930’s. 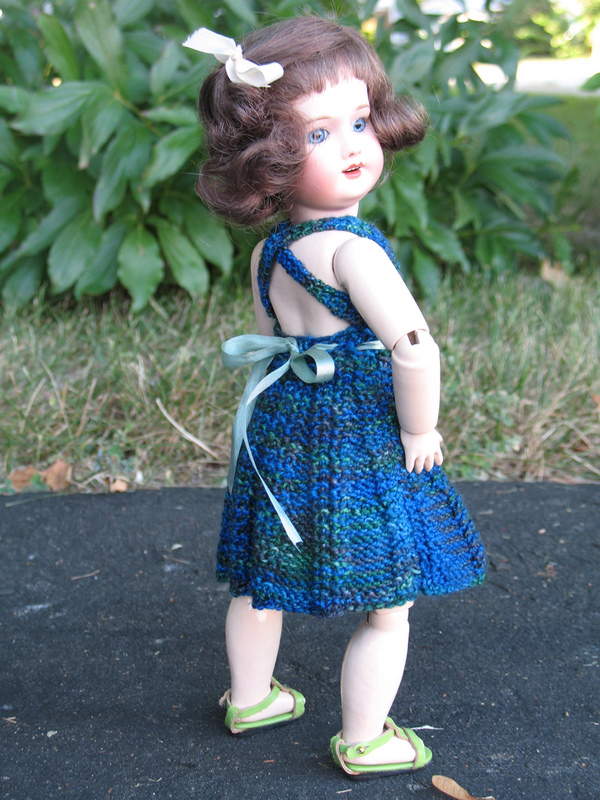 Martine’s outfit is made in that decadent Pure Silk yarn by Debbie Bliss, and in a color that really sets off Martine’s pretty blue eyes. I adore that yarn, but doubt I will every use it for something for me, as it seems to be somewhat tender – and very pricey. Nice to use it for the girls, though, and I get the pleasure of feeling it slink through my fingers in the bargain. I opted to use a bit of rayon ribbon yarn for the tie on this dress, as I don’t feel like this yarn will make a good long term tie solution. As usual, I did lengthen the dress somewhat. Second project done this past evening was something I’d started last year in California on one trip, using yarn purchased in Colorado on another trip, so it’s a bit of a souvenir for me, as well as something special for Remy. Pattern is Mock Cable Knit Cardigan by Patti-Ann Stanley, yarn is Rowan Bamboo Soft (awesome yarn! ), and it was knit with size 3 needles. Project notes: I messed up a few things on this pattern, but I can get by with it. The worst was that I didn’t use a stretchy bind off at the neck opening, and though Remy says he wouldn’t be caught dead buttoning a cardigan up all the way anyway, I still feel a bit bad about the error. He thought the mandarin collar look was sort of neat, and I’m not going to argue with him. I’d just as leave let him like it, you know? I also didn’t have him along when I was making this, so I wasn’t able to make any alterations that might have helped fit his Raikes Bobette style body better. 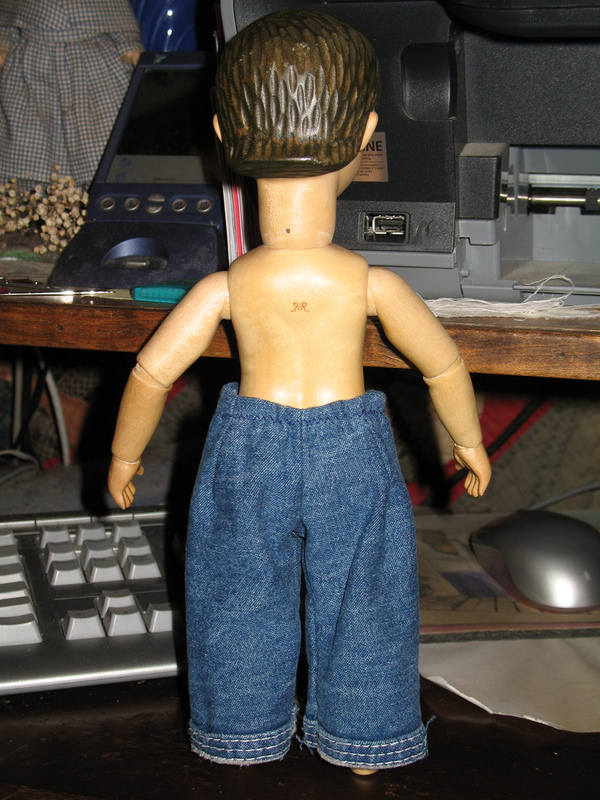 His only real complaint, though, is that he doesn’t have a shirt to wear under it, and the pants I picked up last year on ebay are hopeless! He seems to think a new outfit would be in order. I can’t say I really disagree with him, to be quite honest. The girls are appalled he would even allow me to take this picture, let alone post it. I told them it’s a guy thing – but in all honesty, I think he’s just bucking for some sympathy. 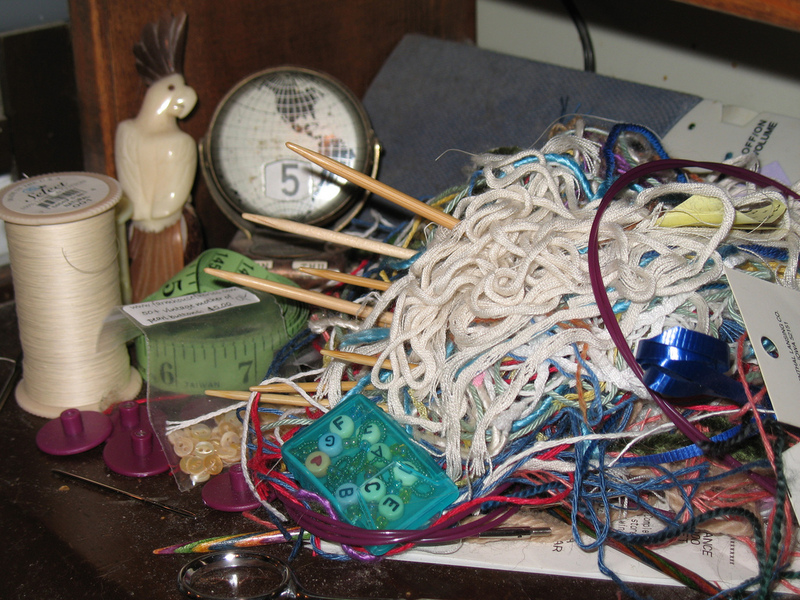 In other knitting – wait! There was no other knitting! Heading into the last hours of the Ravelympic Games, so not sure there will be anything more happen here. I’ve definitely learned to never say never, though. This is the outfit I mentioned having finished yesterday. Mariette and I went out for pics Friday evening. As much as she loves it, she’s a little sad, as it’s the last outfit she’s getting from this Ravelympic challenge. As you can see, it was a breezy day, not the best for modeling a wide brimmed hat! Can you believe this? I surely can’t!!! 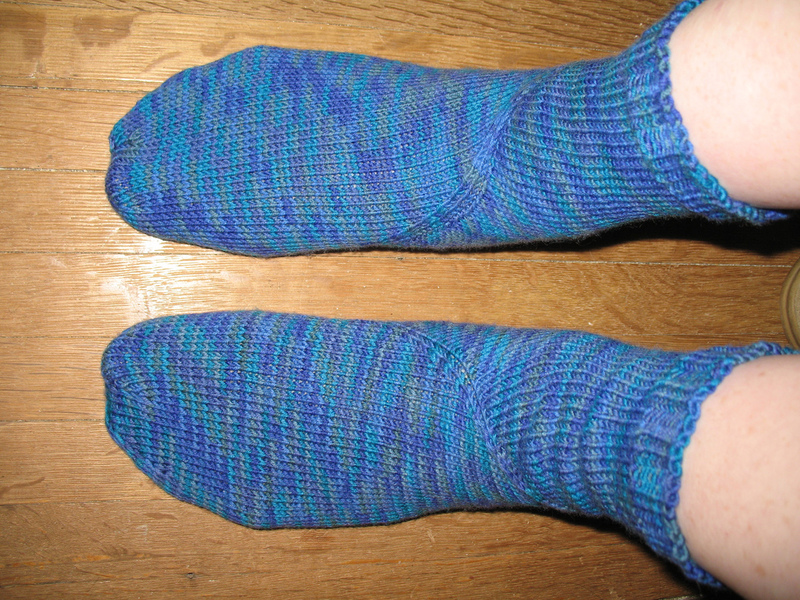 I actually finished my Spiraling Coriolis Socks!!! I had one knit before the challenge started, but this past spring, I made a huge blunder on the heel of the second, and in total terror of the rip out, coupled with trying to imagine what it would be like to figure out where I was in the pattern and where to put the stitch markers led me to stuff them out of sight for months, despite the fact that I dearly loved sock number one. Not only did I do the frogging, I figured out precisely where I was on the pattern with one painfully long parry, and with two more nights of work, I knit an anatomically correct heel, then added the ankle and cuff. 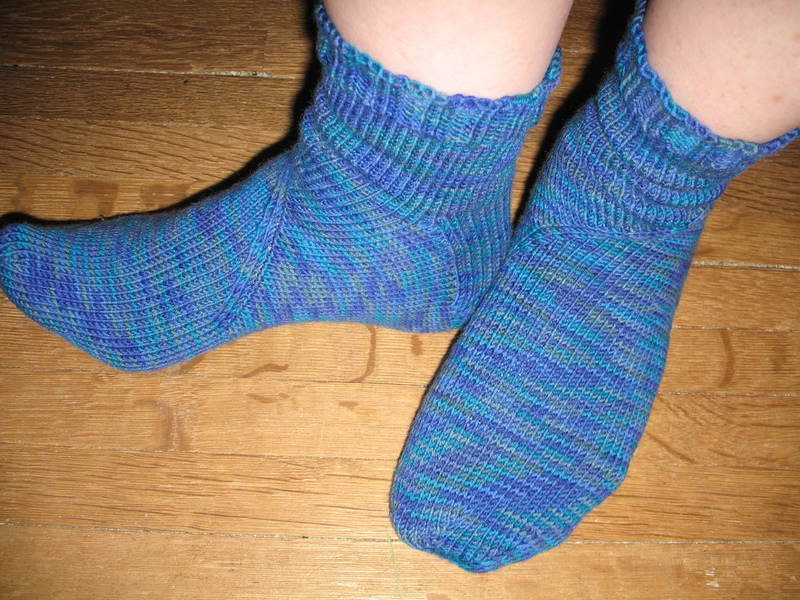 I really did it – my first pair of hand knit socks finished! Slipping them onto my feet was a wonderful treat – the first time I can ever remember having a pair of socks that truly fit my feet – and perfectly! Tell you what… I could really get addicted to this incredible feeling very quickly! Pattern notes: These are Spiraling Coriolis designed by Cat Bordhi and presented in her book, New Pathways for Sock Knitters. I learned early on not to take any shortcuts on measuring and pre-planning. Following Cat’s instructions to the most minute detail provided me with socks that have a glove perfect fit. I used Merino 5 yarn, which held up well to my multiple rippings and produced beautiful socks with nice detail showing on the spirals. However, it was definitely splitty, which was a challenge at times. I chose size 2 needles, which produced a fabric I liked very well. You can see in the photos that I made comparatively short tops. This is because I’m most likely to wear socks with fold down tops, so am used to the feel of them stopping at the top of my ankle. I saw absolutely no reason to knit a lot of extra cuff that would feel odd to me. I only needed 3 balls of yarn, so I have one left over, and I have a number of very short kiddies eying it with glee. I found making the symmetric spiral bands to be an interesting challenge, which definitely made me pay attention to my work, but which wasn’t difficult if I kept my mind to what I was doing. Yes! I did it! 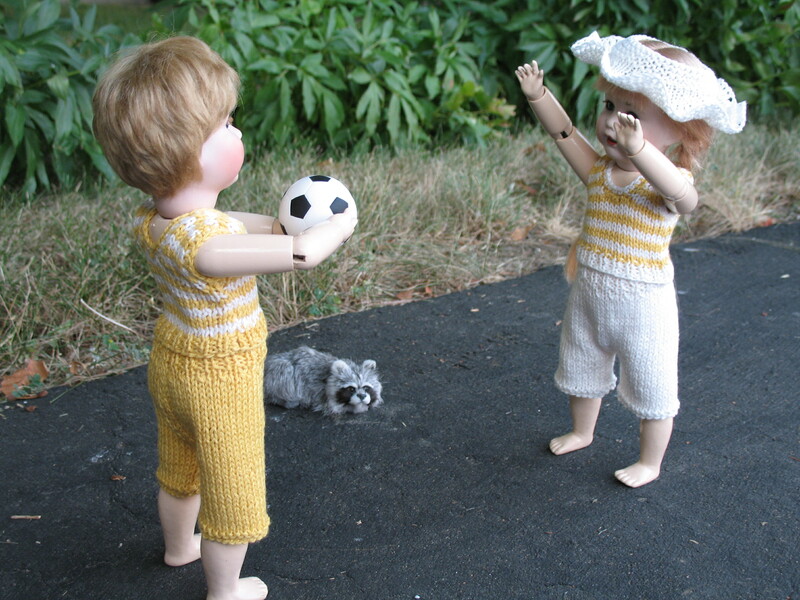 I really didn’t know if I was going to make it done in time with this project, as my knitting group met early this evening, but I was able to finish just in time – well, even early enough that the twins got to go outside and play for a little while! There was little doubt that Mikkey’s Farniente needed to directly succeed Mariette’s. Although there was no hat to make for him, I had not even cast on the shirt, so there was still plenty of work to do. 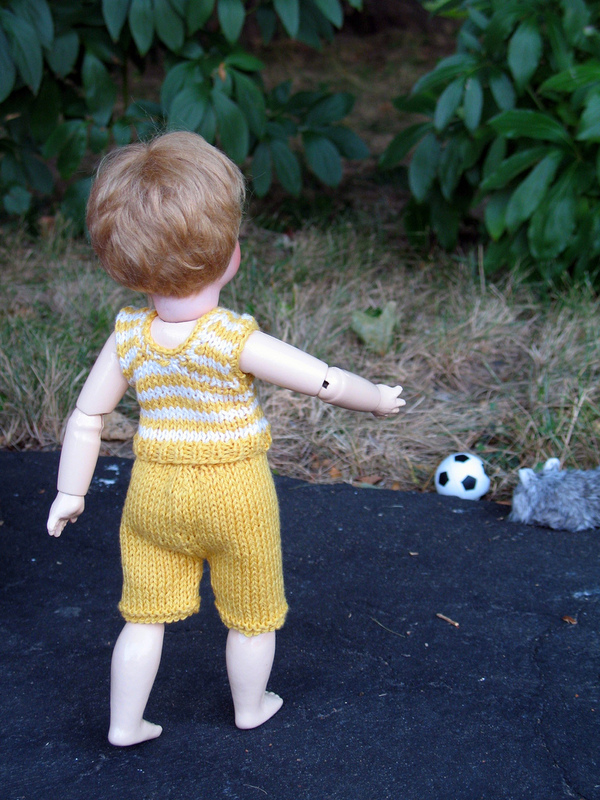 I’d already knit the shorts in the golden yellow, and I’d decided to start his tank top with white ribbing to be the direct opposite of Mariette’s. When I got everything finished and he tried it on, I got an immediate scowl. In his opinion, the shirt was too girlie. After one of those arguments that never goes anywhere with a little boy of his age, Claire, whom the entire crew admires for her fashion sense, added her two cents worth – on his side. Since Mariette was willing, I finally gave in and let them trade shirts, and in all honesty, I have to admit they knew more than I did in this situation. This is their first twin outfits and they are absolutely thrilled to have matches, as you can see. Project notes: Really, it’s all the same as yesterday. Pattern by Inma Iglesias, an interpretation of one of the Gautier-Languereau fashions for Bleuette – Farniente. I used Brown Sheep Cotton Fine yarn, which is, if you will excuse the blatant pun, a fine yarn, and size 3 needles. Pattern was clear and easy to understand, but I’m still frustrated about the neck problem, and will investigate some changes before I make any for the other girls. And, as I mentioned earlier, Mikkey is wearing the shirt that Mariette was modeling yesterday, and Mariette managed to end up with the new one from today. In other knitting, I’ve finished up the next outfit, so come the good light, I’m ready for more photos, and keeping up with my goal of one item per day. Once I finished with it, I started working on my erstwhile Coriolis, and I can say proudly that this time I paid attention to the heel instructions and the sock is much more anatomically shaped. 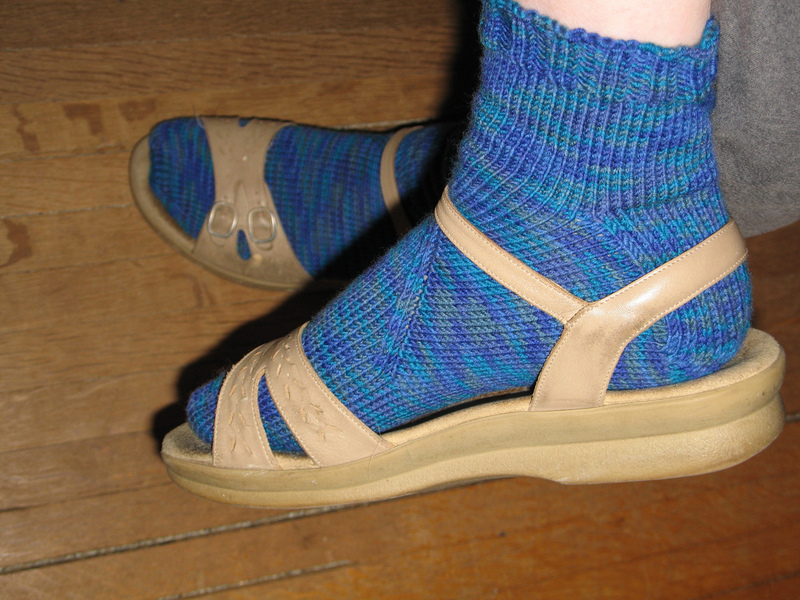 I’m nearly all the way up the back of the heel, so hopeful that I might yet complete it before the torch goes out. I’m not holding my breath, though, as cyan isn’t my color… Oh – and I hauled my swift and ball winder to my knitting group meeting, and in between coaching newbie knitters, I wound four skeins of my prayer shawl yarn into cakes, which means there won’t be a delay when I need them here. I didn’t think it as going to happen, but I made it! I got another project done in time to take pictures and post it, despite the fact that this little beastie gave me some problems that paralyzed progress for quite a while during my prime work time. Despite all the hair pulling, Mariette now has a cute and comfortable play outfit, and she took her poodle, Ruffles, outside for a romp this evening as soon as I tied down the last end. This outfit is Farniente, designed by Inma Iglesias as a copy of a Gautier-Languereau fashion designed for Bleuette in 1938. My problems revolved around finding the neckline too low for my taste. When I added a couple of rows of crochet to make it higher, it lost the stretch needed to allow it to slip on easily. 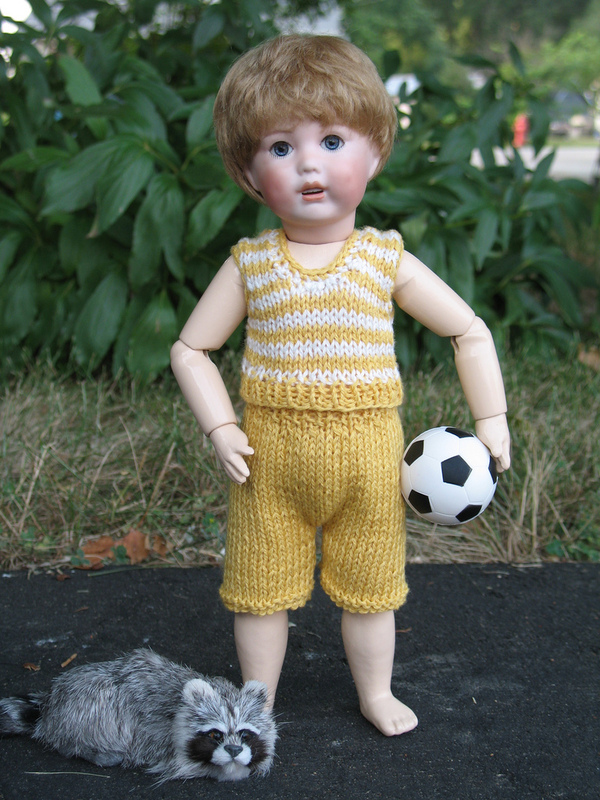 I guess I’m a bad maman, but I have to confess to resorting to head removal in order to put this outfit on the doll. 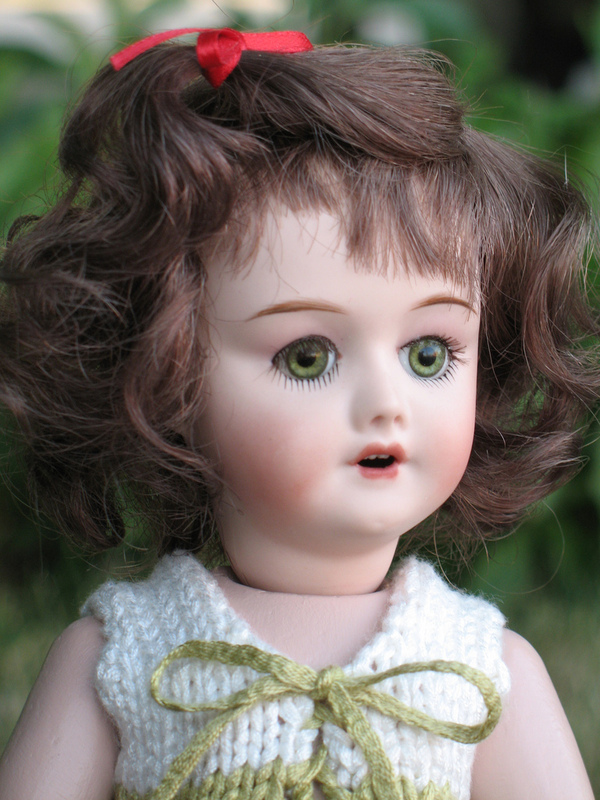 Happily, dolls have no memory attached to that procedure – just a spot of amnesia that they seem to move past quite quickly. I think I suffer more from the guilt than they do from the surgery. Project notes: I worked this with size 3 needles with Brown Sheep Cotton Fine, a yarn which I’ve grown to love. It’s so very soft when its worked… Wouldn’t mind having something for myself from this yarn. I worked two rows of crochet around the neck, then one matching, but looser row around each sleeve to provide a finished look. Inma says there was no edge finishing whatsoever in the original tank top. Personal taste led me to make the shorts a bit longer than the pattern. 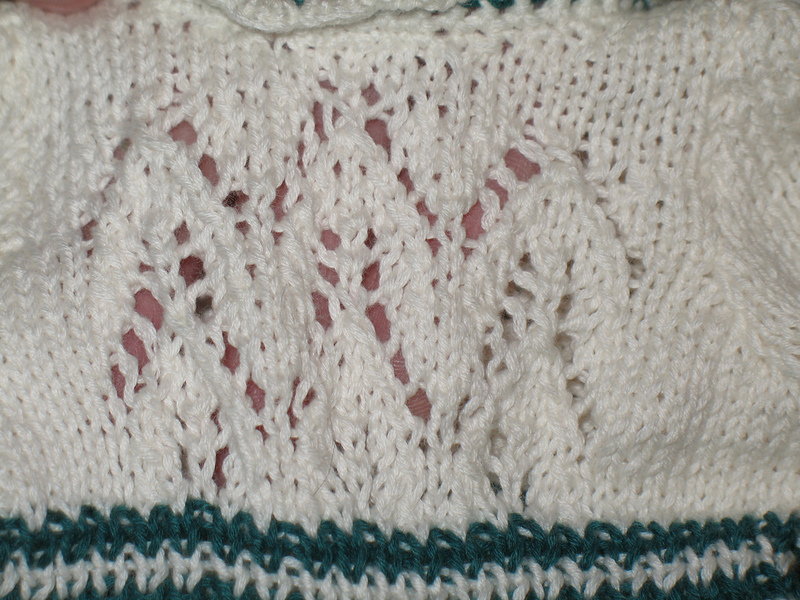 The hat in the pattern has pieces crossing the crown and a wide, flat brim. 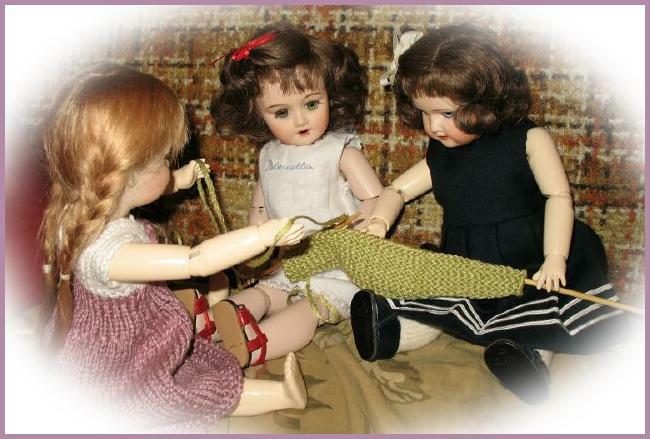 I knit them, then sat down with Mariette to see how to position them. 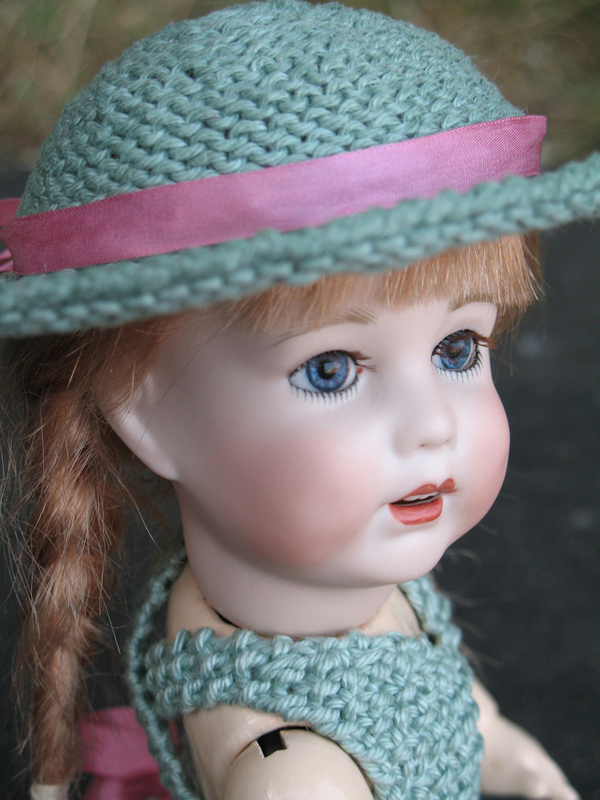 I popped the brim section on her head and it was so cute just as it was with the ruffled edge that I decided to stiffen it that way and leave off the cross pieces. I used the Stiffen Quik again for this project, and it didn’t discolor the white yarn a bit. After putting in about 10 hours work on this outfit, it’s done – and it’s darling! This is probably my favorite of Inma’s patterns for looks, but it’s a real bear with all the finishing work required. I always get done and say “never again,” but it’s a little bit like labor… and I’ve now completed three. Once the skirt, body of the sweater, and the sleeves are finished, there are already plenty of ends to sew under, due to the stripes. 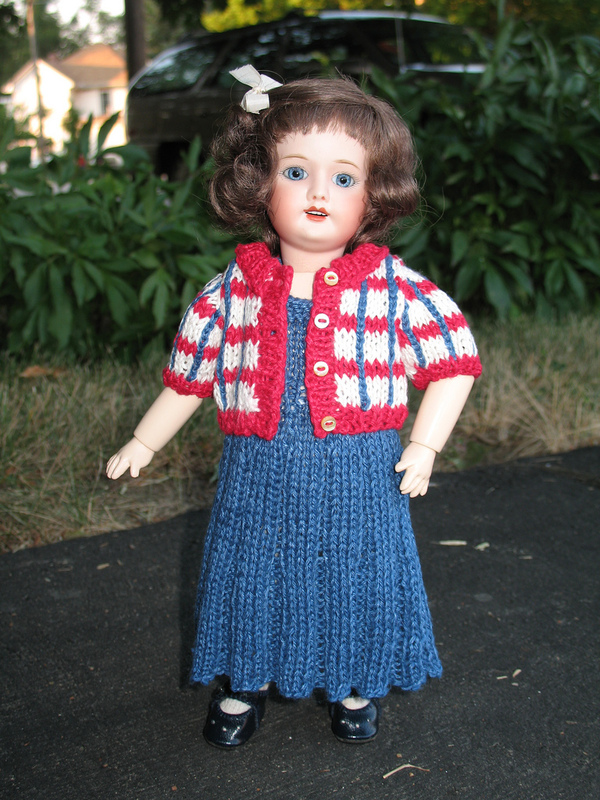 Then the vertical stripes are applied to the sweater – about 2 dozen of them, each with two more ends to darn, followed by all sorts of seaming and sleeve setting, the color stripes on the bottom of the skirt, then knitting the front bands and color, and lastly the buttons. I do believe I spend much more time with finishing work than with the basic knitting. Project Notes: Pattern is Un deux-pièces écossais by Inma Iglesias. 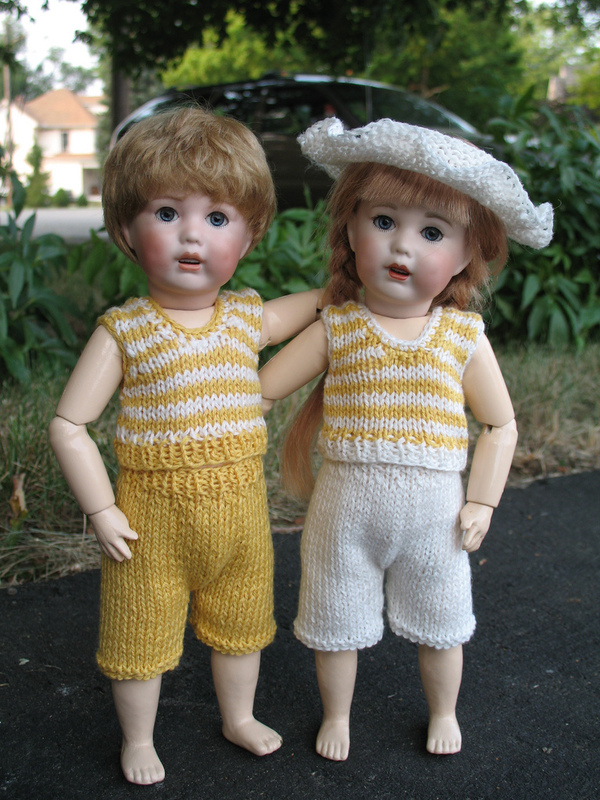 It is knitted in Euroflax sportweight, a linen yarn, on size 3 needles. Although I didn’t think I liked this yarn when it arrived, it really grew on me, softening as I used it, and now I’m rather fond of it and hope to obtain more. Much like cotton, it doesn’t have any stretch. Instead of snaps, I chose to use small buttons and push them through the knit. Although I’ve been able to skip a waist opening on others of this pattern, I felt it was needed with the linen, so there is also a button on the back waistband. I thought it might be interesting to add photos of my first two versions of Un deux-pièces écossais, just for comparison of fiber and color choices. 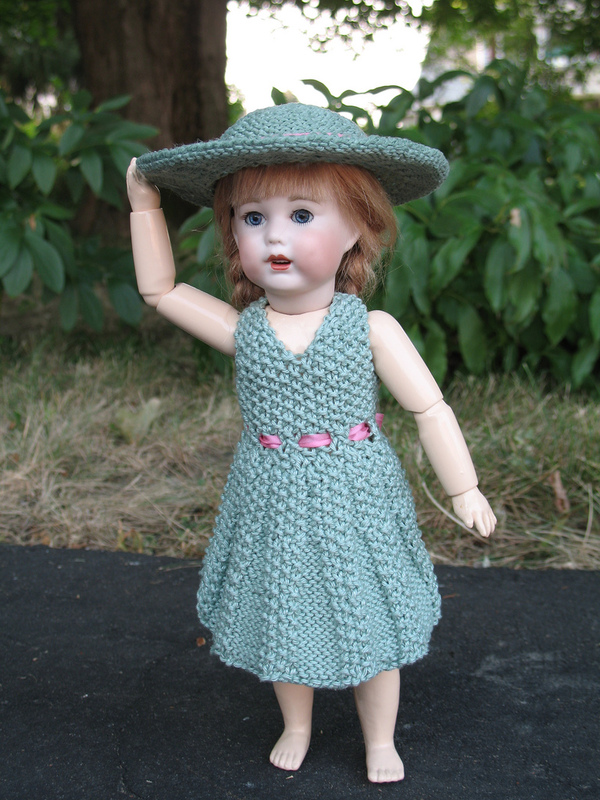 Mariette is modeling my first one, made in Cotton Shine by Knit Picks, which, I have to admit is cute but a little bulky for her size. 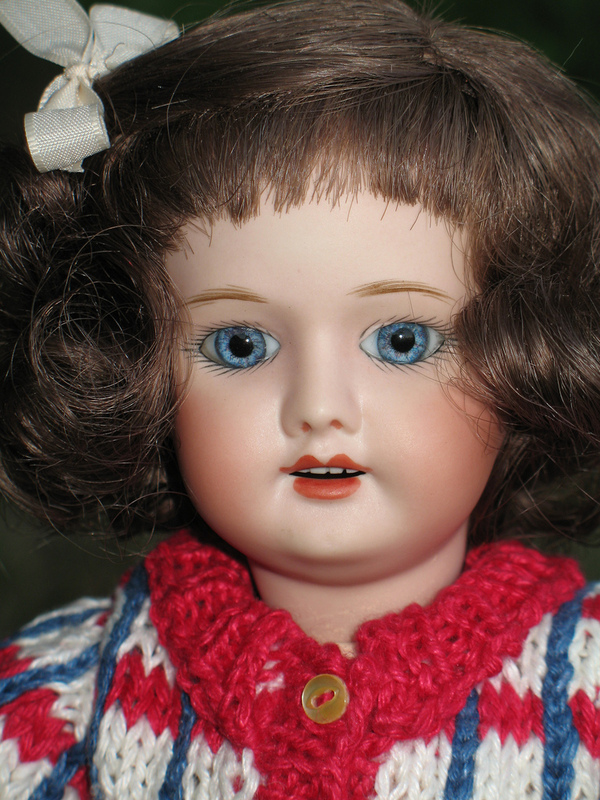 This second photo is Annette Gabrielle, modeling the one that I made on consignment. 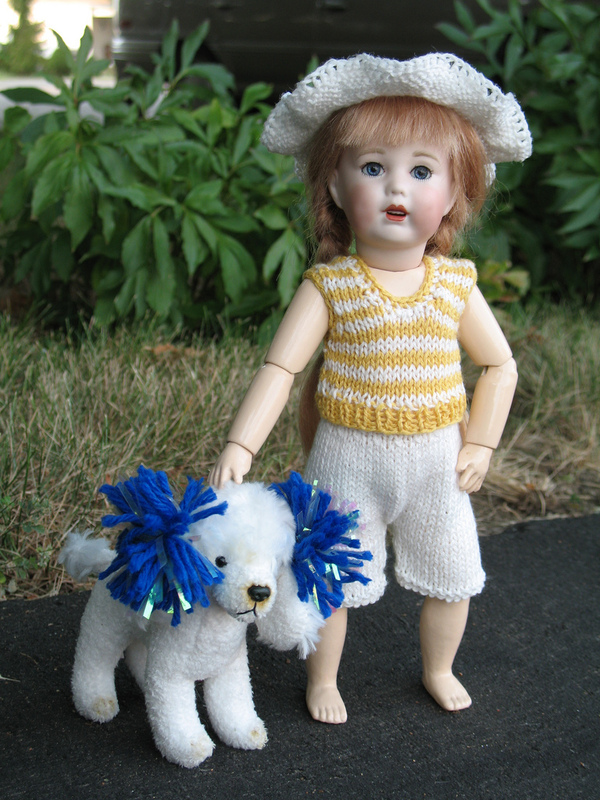 Yarn is Knit Picks Palette, which is wool, and it’s done in the same color scheme as Martine’s new outfit. 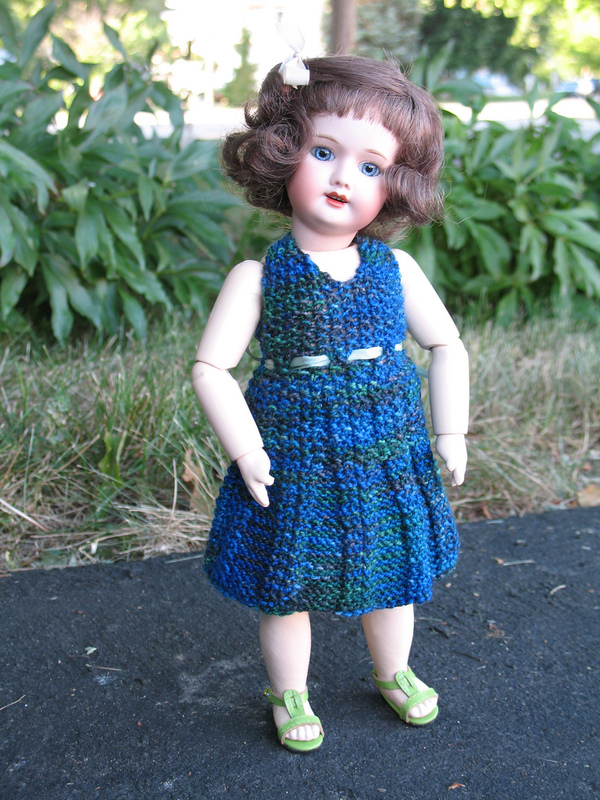 The Palette yarn made a very nice outfit, with a somewhat less dense fabric than even Martine’s. 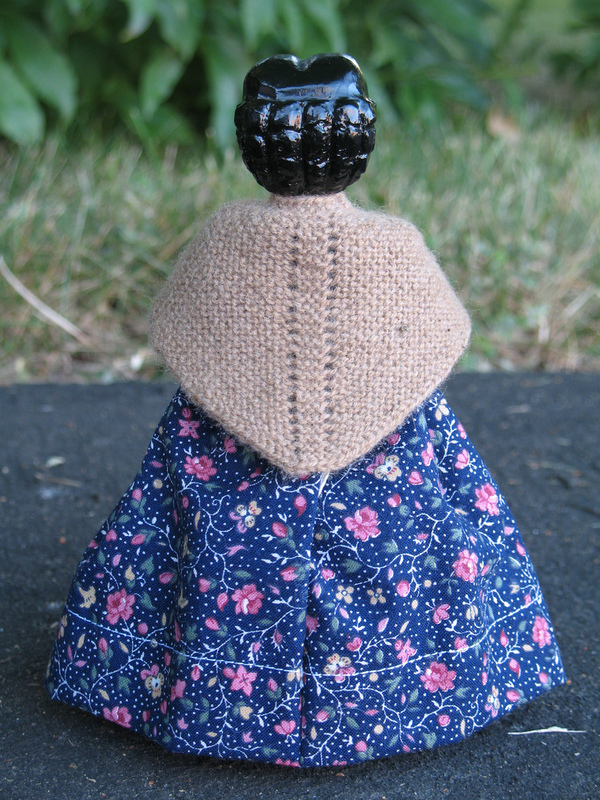 It had an exceptionally good look for a vintage reproduction doll dress, and I’d definitely recommend it for such work. Now, I said that Martine had an exceptionally good day. Actually, she’s positively glowing! I was on a roll, and I managed to complete a second outfit for her late in the afternoon, so we had quite a photo shoot as the day waned. 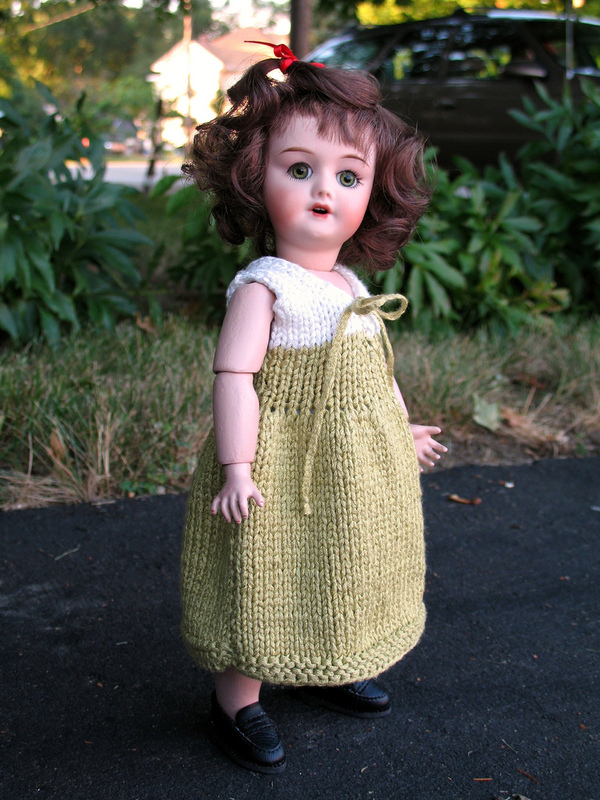 This is Élégance, the same outfit I completed a few days ago for Mariette. Like hers, it’s worked in the Euroflax sportweight yarn, but what a difference the color change makes! Martine is not a hat girl, so we skipped that accessory. No project notes really needed, as it’s the same as Mariette’s outfit and the Un deux-pièces above. 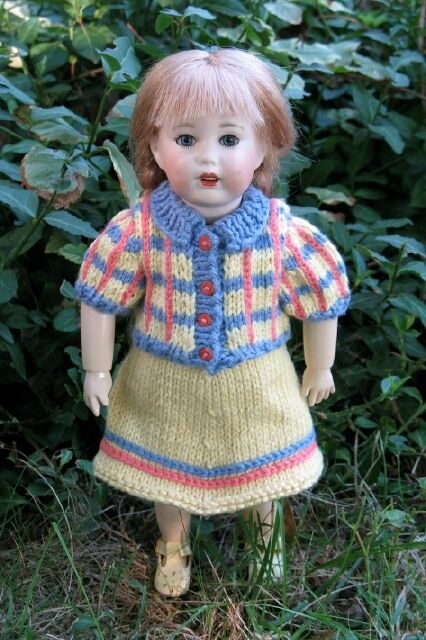 I’d chosen to use the same yarn for both of Martine’s outfits as a bit of an economy, since the Euroflax comes in very large skeins – especially compared to the needs of a doll clothing knitter. I designed them to have a totally different look, hoping to minimize the appearance of reusing the same yarns, but I totally neglected to realize the benefit of doing so until this evening when were were taking pictures. I’d inadvertently created a mix and match wardrobe for her! I have never seen her look any happier than she looked tonight when she realized she has three new outfits, each with its own special look. What more could any Bleuette want? 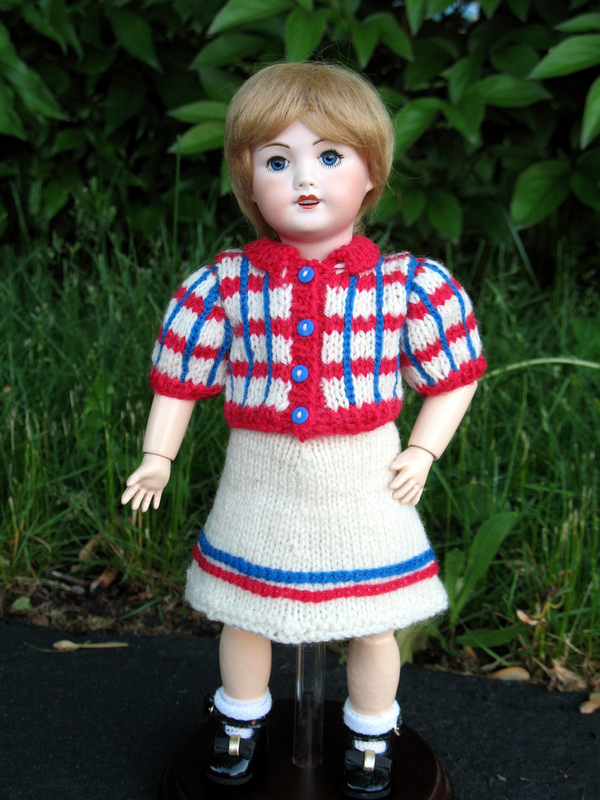 In other knitting, I spent a pretty frustrating evening working towards completing the next outfit. Don’t know if I’m going to make it or not, but at least it’s finally working for me. I also put in at the very least a dozen rows on my prayer shawl project. In 12 days, I have 12 completed projects, 11 of which count for Ravelympics, so I’m feeling really pleased with what I’ve done. I feel a bit like Michael Phelps when I say that my dream is to actually have 17 completed projects in the 17 days of the events – and it would be even better if that was 17 qualifying projects! However, the game is getting a little tougher now, so I’ll just have to give it my all and know that I’ve done well even already. But it’s definitely not time to slack! If I had a ringer, the project I did today might be the guilty party. After putting in so much time yesterday and not having anything set for today, I finally decided that the appropriate action was to pull out my easiest project, and I was able to finish it by sewing in about a dozen ends and seaming the sides in less than an hour, running just ahead of the waning day for pix. I was truly glad I’d taken the time yesterday to go through and steam block seven of my remaining projects. I’d never have caught the last daylight if I’d had to press this first. This is Malloree Nanette modeling Succès, an interpretation of a dress designed for Bleuette and sold by Gautier-Languereau in 1937, designed by Inma Iglesias. 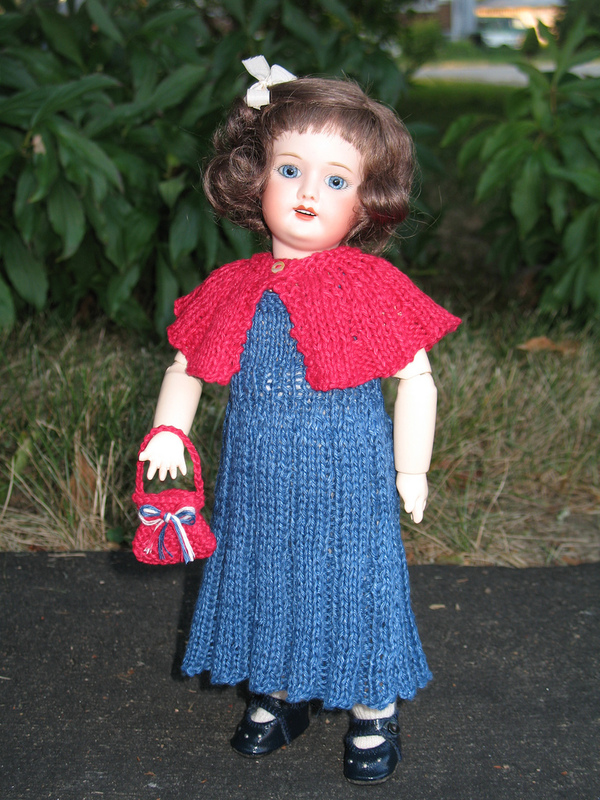 Malloree was more than happy to slip out of her two piece ensemble with a wool jacket and into this comfortable summer frock knit from Berocco Glacè rayon ribbon yarn. I think the waning light was wrecking havoc on the colors, and no matter how much I tweaked, I couldn’t seem to get a truly accurate depiction of the light olive color of the yarn. 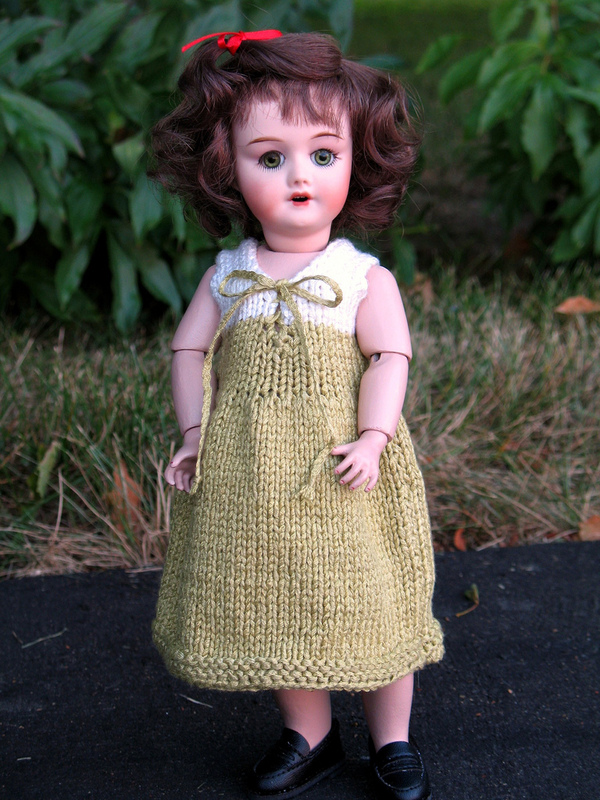 It’s truly a pretty shade of green, and sets off the green of Malloree’s eyes beautifully. The bit of green showing in this portrait is probably the closest to the true color. Project notes: Most of the info is already given above. I used size 3 needles. I like working with this yarn, but it’s really a bit heavy for this pattern, producing a thick and elegantly weighted fabric, which is a bit too much on a doll of this size. 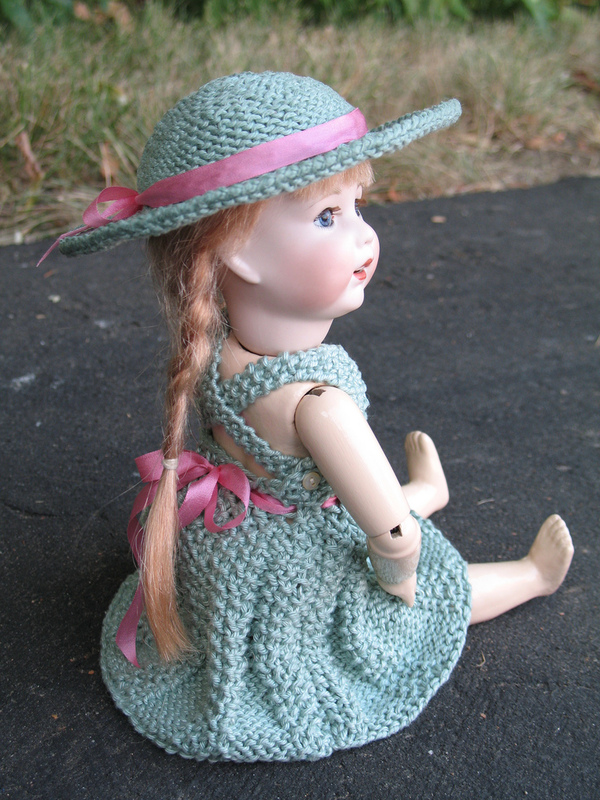 However, Malloree seems to be able to carry it off better than Mariette, who has this dress in the same yarn in mauve. Malloree is on a Global papier mache body, and that does cause some problems. The measurements are the same or similar to the Global wooden/JN Bleuette bodies, but the mass is distributed much differently. The body is very narrow and deep, and by far the majority of the mass is distributed to the front. If you compare the fit of Malloree’s dress with that of Mariko’s, you can see the difference. We could skate by with this pattern, but in general, if you find yourself sewing or knitting for a papier mache body, I strongly advise doing a mock-up rather than expecting patterns to just fit based on girth measurements. In other knitting, I got the increase stitches worked into the wing section on my Coriolis Sock, so next step is starting the actual heel. It’s not much progress, but it is the last of the staging and verified my confidence in believing I know where I am. I also finished another Bleuette outfit – one which required most all of two evenings of work. Pix tomorrow, awaiting the light of day. I feel as if I skimmed in on this one by the skin of my teeth in a way. It was a terribly frustrating result, but I have dusted myself off and will be back into the fray regardless. And I did earn this today! 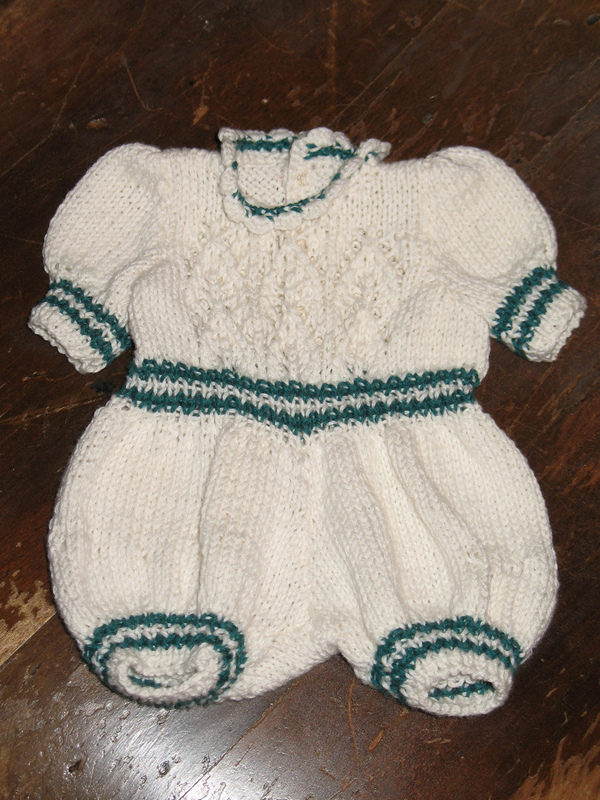 The project in question was a little romper suit, made from a Doris Thurlow pattern back in 2002. (Yes, I do realize that was 6 years ago…) I never got around to sewing on the buttons, nor did I make the little hat – but I’m getting a wee bit ahead of myself. 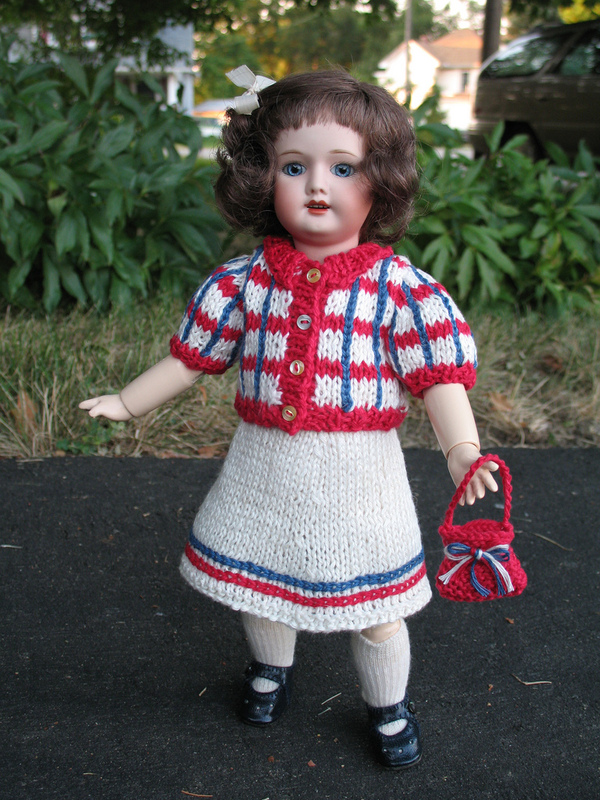 The pattern was designed for a standing doll with a 6.5″ body (or 6.5″ tall?) and I wanted it for a little fellow who is, if memory serves me, more like 12″ and generally wanting to sit with his pudgy, unsteady baby legs in front of him for support. I did well with the adaptations, putting short rows in the seat and sizing up both yarn and needles, but then, beings as I so love finishing work, stopped sans buttons. 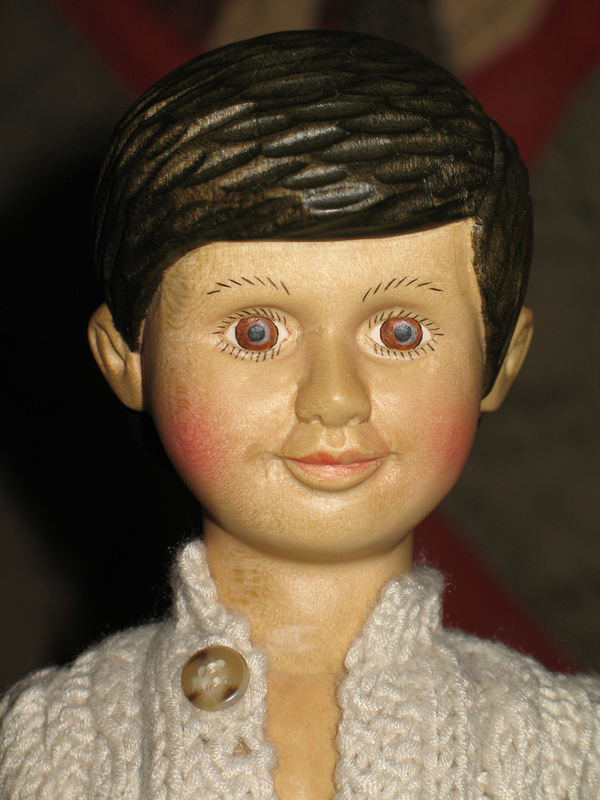 I don’t suppose it helped much that dear little Aaron’s head, eyes, and pate are in a box in my sewing room, his body parts are in a box in the family room, and his replacement wig took forever to arrive, then came at a really bad time and has been mislaid Heaven only knows where. With no little fellow to wear the outfit, there wasn’t a strong craving to complete it. It looks really stupid on him. It is probably too big even with hair. Then I dug out the little pearls I wanted to run down the back for closures, only to find they didn’t fit through the eyelets. When all was said and done, the actual project turned out to simply be sewing 3 buttons in place – period. I could have been done in 10 minutes, but it took me 4 hours to make that little discovery! I do want to add that this was the very first time I ever did anything remotely resembling lace, and I was both amazed and quite proud of myself. I can look back even now and be quite startled that as little as I knew about knitting at the time, I was able to pull this off. Project notes – not much to say! The yarn in question is Brown Sheep Cotton Fine that I purchased in person (decadent delight!) at Patternworks on a lovely and quite long solo trip through New England. I really love working with this yarn, and anticipate buying more in the future. The pattern, as I mentioned earlier, is one of Doris Thurlow’s, but I couldn’t find it on her site, so it might be discontinued – KDF 162A Heubach Character Boy “Buster.” In general, I didn’t have too many problems with it, if I’m remembering correctly, though the hat instructions had several confusing spots to puzzle through. I used size 2 needles since I was wanting it larger. 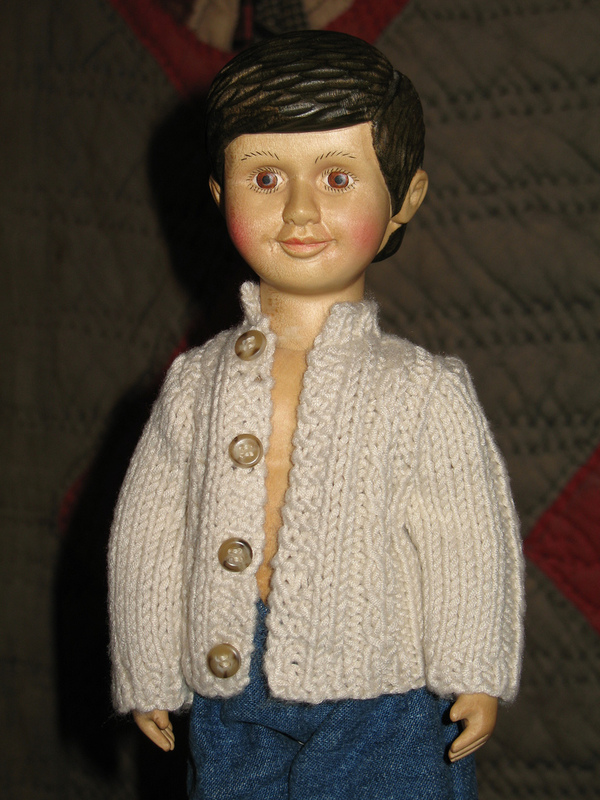 Aaron is an antique Armand Marseille baby. I can’t remember quite how tall he actually is, and it’s a bit tough to measure him in his current state. One of these days, he will be the cover boy for a post – hopefully sooner than later! In other knitting – what there is of it – I pulled out an Un deux-pièces écossais that I’d started sometime early last year for Martine. 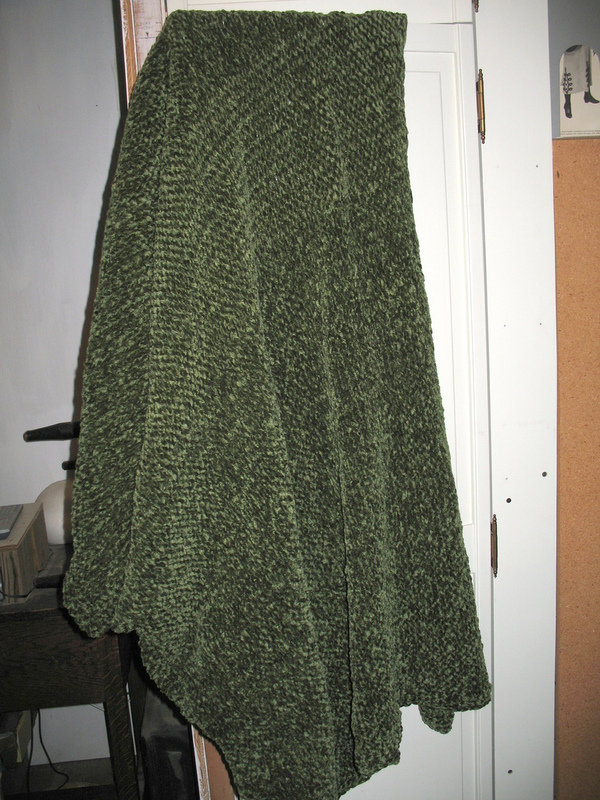 I knit the skirt, half done, to completion, then with my brain disengaged, started sewing the sleeves in place. About halfway around the first one, it suddenly dawned on me that I’d never put the vertical stripes on the sleeves, nor had I quite finished those on the body. That left me not only with the joy of much more finishing work that I’d originally noticed, but it also added the distinct pleasure of adding stripes to a sleeve securely sewn into a tube and attached halfway around to the bodice. Such a bright soul I was tonight… Suffice it to say, I didn’t get it finished even with nearly 3 hours of effort, so I’m not sure about a medal tomorrow at all. And for that matter, now that I’ve spilled this much of the story, I’m not sure I can hope for much of a post, either! The other thing I did was perhaps the bravest and most dreaded action of this whole maneuver thus far. I have a Coriolis sock that suffered a tragic error, and it was too much to tink, so I did a lovely semi-frog, then had realized that I had no way to tell where I was in the project. Just to make things a bit more interesting, it’s laid untouched for three months. Now, keeping in mind that I’ve made precisely one complete sock in my life, this was a bit of a hurdle to overcome – or, perhaps to keep it in the correct sport, I was looking at what appeared to be a sumo wrestler. I’m happy to report that after a bit over an hour of work, I now have stitch markers back in place, found the proper beginning to a row, and actually know where I am on the pattern! Knitting this is the easy part; I’ve pinned the monster – and what a relief! My Coriolis socks actually have hope of being completed, and I’m excited! Day 9 – Hump Day! This was the center day of the event, and another good one for me, as I finished a huge project and got it posted, along with the one from yesterday that needed daylight. I actually have 3 finished items to share tonight, though only two are for the event. First, the project from yesterday – my first medal winner… This is Martine Babeau modeling Hèlios, which had been knitted – yes – for a year or so, but needed all the finishing work completed – seams and something to attach the straps. I chose to use fat matching beads instead of snaps, as I just hate sewing snaps. I just love the view from behind, and Martine had a great time showing it off. She raided the shoe box and found these cunning little Boneka sandals to set it off nicely. Project notes: Dress was knit from Hèlios, an interpretation by Inma Iglesias of a 1936 Gautier-Languereau outfit designed for Bleuette. I used Cherry Tree Hill Supersock Merino in colors that reflect Martine’s love of all things relating to the sea, and did the work with size 3 needles. 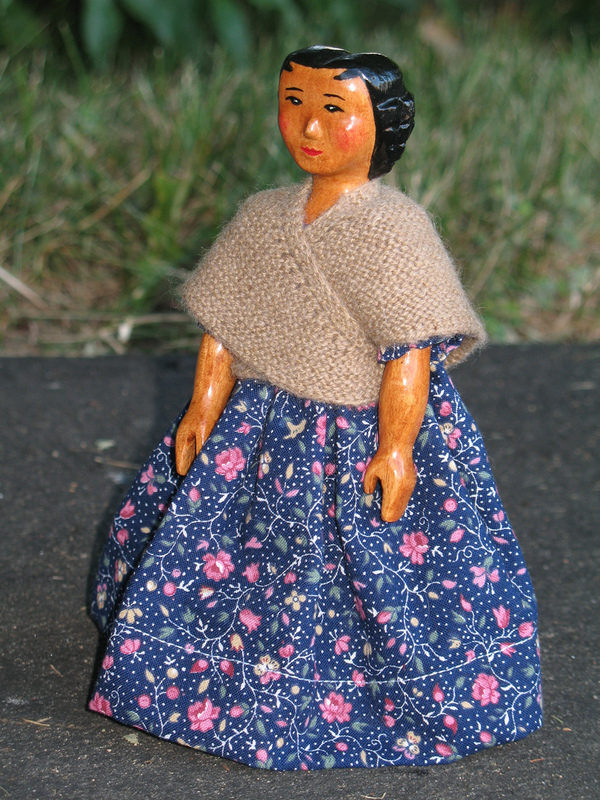 As I’ve said before and will say again, I’m sure, Inma’s pattern was a delight to use, and the dress is a perfect fit. There is a hat included, but Martine isn’t much for hats, so we chose to skip making it. The sash is silk ribbon. My second finished object today isn’t a Ravelympic project, as I was working on it in the days just preceding the start of the Games, making it ineligible. I finished all but the sewing in of ends the morning of the 8th, and decided I’d use a few leftover minutes a day or so back to do that and give it a quick wash.
Hitty Lin is modeling this Danish Heather Shawl that was in a recent issue of Spin-Off as an adult human size pattern. I used laceweight yarn in a wool/cashmere/angora rabbit blend on size 000 needles to produce a dense fabric with all the fine detail of the original, and I have to say that I’m very much in love with the results, despite thinking myself quite insane for attempting the feat. I’m hearing pleas to make some more, and I’m wondering a bit if they might be marketable – and if so, how much one would charge for such a thing. 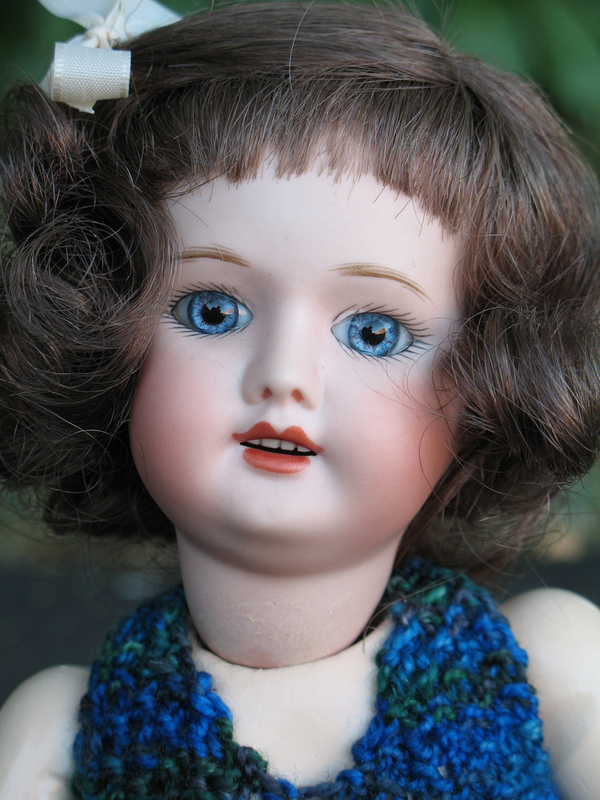 Oh, and if you aren’t familiar with Hitty, she’s 6.25″ tall, and this shawl is quite small and fine in order to keep it in perfect scale for her! While we were outside having our photo shoot, I caught this picture of Martine being a very helpful coach for Hitty Lin, who is not used to modeling at all. I just had to share it. The last project should perhaps be considered my marathon – fitting enough, since the ladies in Beijing were running their marathon while I was knitting the homestretch tonight. I bound off while Michael Phelps was receiving his eighth gold medal, and was somewhat wishing this had been my eight finished object rather than my seventh. 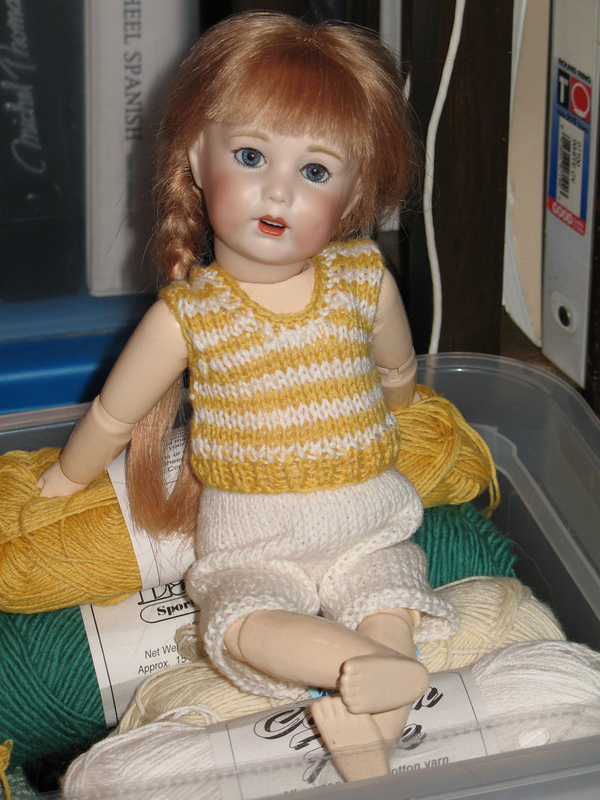 And, in other knitting, I have a very good start on another doll outfit that needs completion, so hopefully will have it done in time for tomorrow. Stay tuned! And another outfit finished – the one to which I alluded yesterday has been duly photographed and logged into Ravelry, and I’m happy as can be to have earned another medal! 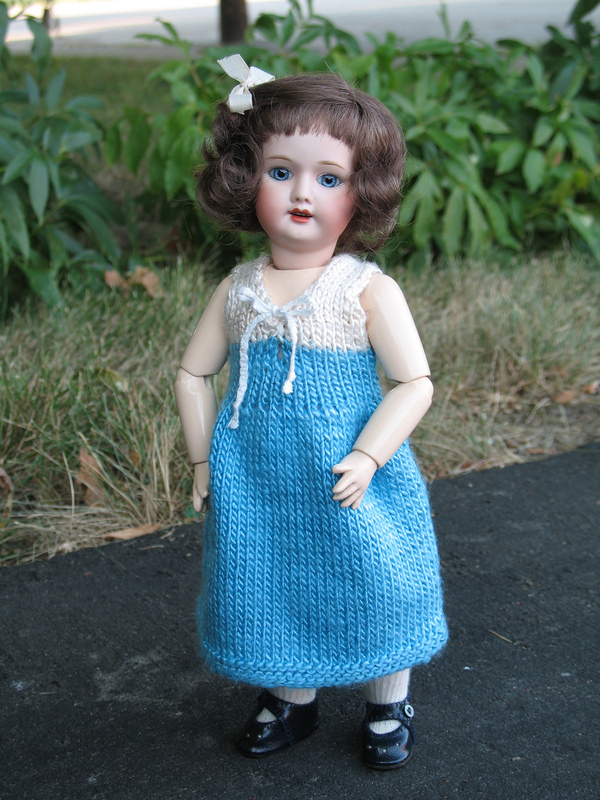 Mariette Elise is today’s model, this outfit having been hers from the very start, and as you can see, she’s one happy little Bleuette today. I’d done all the knitting last year, but not even begun to touch the finishing work. The crown and brim of the hat needed sewn together, as did the side seams and the purse. 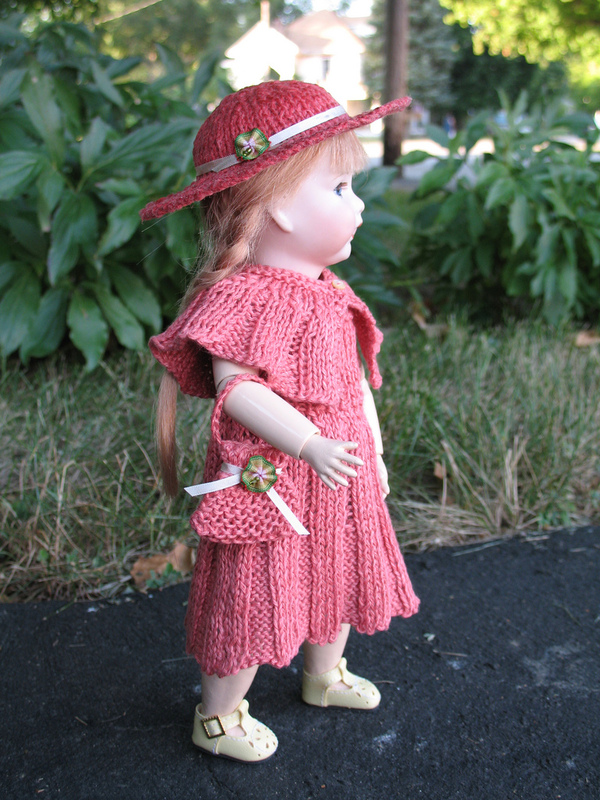 I crocheted a purse strap, sewed in all the ends for all four pieces, blocked the cape and dress, added a button to the cape, and shaped and stiffened the hat. Then I spent about an hour trying to decide just how to trim the purse and cape. Embellishments aren’t my forte, but I think these work, and, like I said, Mariette likes it, so that’s the important thing. Pattern notes: This pattern is Élégance, a reproduction of a 1936 fashion by Gautier-Languereau for Bleuette, interpreted by Inma Iglesias. 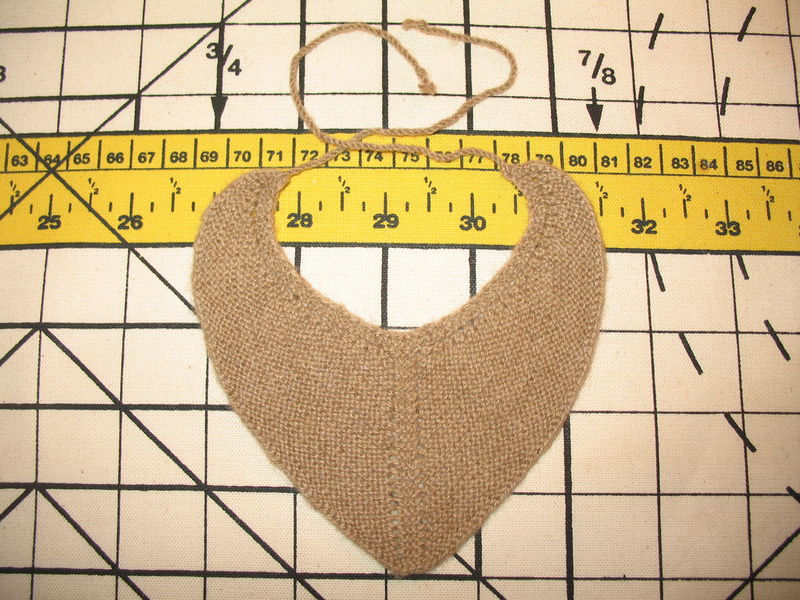 It was knit on size 3 needles from terracotta sportweight, Euroflax yarn. I found that the yarn felt somewhat like string while knitting it, but it softened in my hands and even more in the water, and ended up with a very nice feel to it. I honestly enjoyed working with it, which is a good thing, considering how much more I have. As is my habit, this is a bit longer than the original, but otherwise, the pattern is worked as written and fits absolutely perfectly. Original is shown in two colors, but we opted for just one for Mariette. I used Aleene’s Stiffen Quik to shape the hat. It worked nicely, but it darkened the side of the hat which was sprayed, leaving it looking as if it is wet. In this situation, that wasn’t a problem, as it provided the perfect contrast to the outfit, but there are some places that I wouldn’t be so pleased with that result. 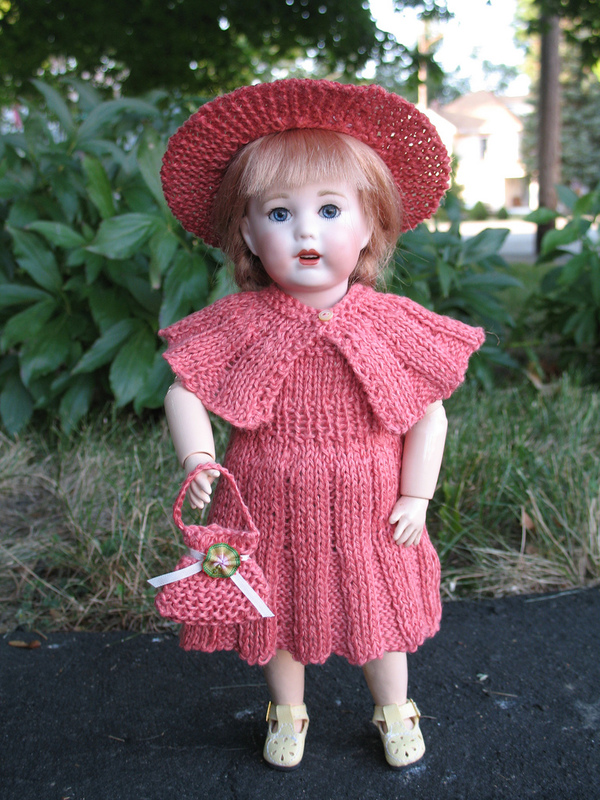 In other knitting, I finished and pressed another outfit, which will be posted tomorrow following a daylight photo shoot. I also got another ball of yarn worked into the Chenille Throw. I’m thinking the next ball will be the last. It’s getting so big that it’s really tough to manage, so I’ll be glad to be done with it.